The most important tool to a chef in the kitchen or any home cook for that matter is their knife set. Any of these knives, especially the chef knife, will be in constant use more so than everything else. So, it’s no wonder why you would want your knives in tip top shape. A high-quality knife can be quite pricey so taking care of the knife is crucial. Sharpening and honing the blade’s edge is a daily routine to any chef. For the most part, people use a sharpening stone or sharpening steel. But if you want to get a really sharp edge, then you will want the best electric knife sharpener available. While a sharpening stone or whetstone is a great way to sharpen your knives, it does take a lot of practice to get the edge perfect. Sometimes the whetstone will not possess the capability of sharpening the knife’s edge as close as you would want it. Here is a video to show the difference between all types of knife sharpeners. 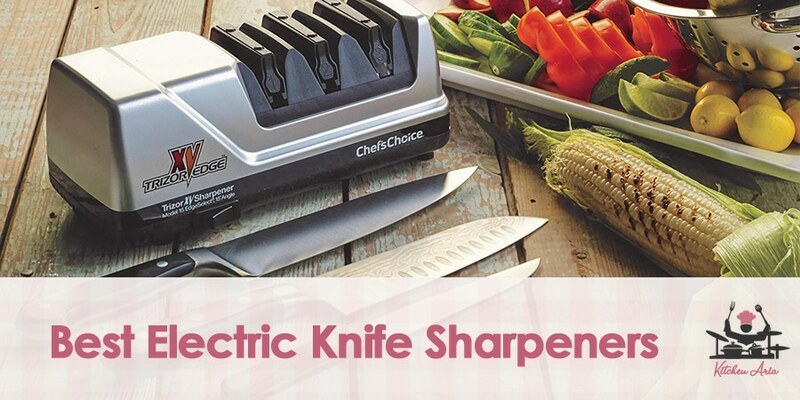 An electric kitchen knife sharpener can sharpen and hone the edge so close it is almost paper thin! Well maybe not that thin, but there are some that can do 5-degree angles which is still pretty close. This is very important when sharpening a fillet knife or a very flexible blade. They are also able to do all kinds of knives, not just kitchen knives such as hunting knives, hatchets, scissors and lawn mower blades. Utilizing an electric knife sharpener will also create a safer work environment for you. With the knives you are using, there will be fewer accidents and injuries. Some say that the most dangerous thing in a kitchen is a dull chef knife. Well, that is actually true. If the blade’s edge is dull when you go to try and cut something denser or solid, the blade could slip, cut a different direction or require heavy chopping which could result in injury to yourself or others. This happens way too often. To learn more about how to properly use an electric knife sharpener, check this video. In this article we will go over what you need to know about electric knife sharpeners before purchasing one as well as some of the cool features you may want. We will also cover some of the electric knife sharpeners available on the market today. An electric knife sharpener is not a cheap item to purchase but will serve you well in the years to come as long as you make the right decision. You will want to know everything there is to know about the machine before you make a purchase. As with buying any item online, you are not able to touch it or use it before buying, which is kind of risky when you are purchasing something with moving parts. Some models may not offer the capabilities you need to hone your knife properly. For instance, some of the electric knife sharpeners are meant to be used in a home. While others have the capability to be used in the commercial kitchen setting. Knife sharpeners are pretty versatile, although some do lack some of the cooler features the high-end models possess. A feature that may be on one model may not be on all models. One of these features is the ability to change the grit of the roller or the plates. This allows you to be able to sharpen all different kinds of knives. Heavy plates or a coarser grit is perfect for grinding stainless steel and the harder metals. But if you wanted to sharpen carbon steel knife you would need to use smoother rollers or a softer sharpening stone. High carbon knives are more widely used among chefs. A high carbon steel knife is a softer metal that can be brittle which can easily break or chip when sharpening incorrectly. That is why the actual stones or belts sharpening the steel need to softer. It would be a bad day if you happened to break your knife because you were unable to change the grit settings on your electric sharpener. Most models have several different slots for different settings for angle and grit. In some cases, one electric sharpener may be able to sharpen serrated knives. Serrated knives are very hard to sharpen and must be done by hand. For the most part, the machines are not much to look at and there really is not any room for improvement aesthetically. They are more or less just a box that plugs into the wall that pretty much looks like a toaster. However, there are some that look better than others. The design is really not what is important, the construction and integrity of the machine is what matters. You will want a strong and sturdy electric knife sharpener that will do the job in the most efficient way possible with little to no mishaps. Make sure the device is not prone to shaking or become unstable within use. This can be very dangerous and needs to be avoided. Get an electric knife sharpener that will also grind the knives without making too much noise or creating too much of a mess at the same time. Some machines have a tendency to spit the metal shavings about. Having a catch-all or a guard will help to prevent this from happening. Coincidentally, the higher end models are usually made by actual trusted knife makers that have been making knives for decades. So, if they make a quality knife then most likely, they make great knife sharpeners as well. This is a good rule of thumb to remember and consider when purchasing an electric knife sharpener. A warranty will help to protect your electric knife sharpener when it breaks. A quality knife sharpener will come with a lifetime warranty if they are confident it will last forever. If it doesn’t, then you should probably look at other machines. There is a lot of moving parts in an electric knife sharpener and the product should be backed by some kind of guarantee. This is one of the better models available on the market today. This electric knife sharpener is more common to be used by a professional chef or for grinding multiple knives in a commercial kitchen. But the machine can still be used in any home kitchen just as easily. The Work Sharp Knife and Tool Sharpener has the capability to sharpen just about anything that needs sharpening, including serrated blades which is not very common in a knife sharpener. The machine uses belt driven grit to sharpen knives which make it easy to get in the harder to sharpen areas. The belts are also interchangeable and come with a variety of different grit levels from very coarse up to 6000 fine grit. The belts are also flexible which make the process much easier. The machine also allows you to adjust the speed of the grinding belts for slow speed honing or fast speed grinding. This helps create a sharper edge in the long run. There is also a function that allows you to change the angle of the blade to be sharpened. The levels range between 15 and 30 degrees to get that razor-sharp edge to require. This electric knife sharpener is a great machine and very easy to use. You are able to pull right out of the box and turn on to use. No calibration needed, just start grinding. The knife sharpener features 3 different levels of sharpening. The first level is used to grind the blade down, mainly for really dull blades. Then the next level is for high-speed honing to get the knife really sharp. The third level is to be used as a polisher for the blade. However, the polisher also has the ability to sharpen serrated blades as well. The electric knife sharpener is sturdy, quiet and reliable. Just run the knives through on each side for each level and your knives will be incredibly sharp every time. This electric knife sharpener is exactly like the one we just reviewed in every way except for a few minor details which may make you sway towards this model. The sharpener has the same 3 leveled system with all the same features but is a little bit pricier than the other. The reason being is because it is manufactured by the largest knife maker in the world. Wusthof has been making knives for over a century and are a very well trusted brand. The other largest reason this model is better than the other is that instead of a 3-year warranty, Wusthof offers a full lifetime warranty on all of their products. You cannot beat that! Here is another 3 level, electric knife sharpener that does grinding, honing and polishing. However, it is a little bit more limited than the others we reviewed. The angle is able to be changed to two different settings but there is no gear speed change available. The machine seems to be made of a thinner plastic which may cause problems in the future for durability. For the price, this will definitely be a bargain buy. This is a really nice little knife sharpener that is a little different from the last models we reviewed. This one has taken the best of both worlds to create a quality machine. The knife sharpener has two levels of sharpening: grinding and honing. Which is really all you really need to sharpen a knife as it only does kitchen knives. The machine is also belt driven which makes it easier to sharpen the hard to reach areas. The machine has been labeled one of the safer machines with guiding blocks, finger guards and a one-touch programming system. The machine will automatically turn off when the grinding process has been completed to whatever you set it at. For the money, this is a great deal and perfect for any home cook looking to sharpen their set of knives on a regular basis. This electric knife sharpener is not the best quality machine available. It is a very cheap electric sharpener, but that you can tell the machine was poorly and cheaply made. This sharpener works using diamond stone plates instead of belts which in time can wear down very easily and then need to be replaced. There is a two-level system to sharpen kitchen knives only though. Plus, there is no speed adjustment, no angle adjustment and the machine is made of cheap plastic. This is not a recommended electric knife sharpener as it will burn out or break very easily. And last and definitely the least, we have this electric knife sharpener that you might as well throw in the trash. The machine has the same features as the last reviewed product but with even less quality to boot. The largest fallback of them is going to be the grinding wheels. Grinding wheels are already the worst way to sharpen a blade’s edge and you never want anything less than diamond. However, this one uses sapphires instead which barely scrape the surface of the edge. If you feel like wasting money on an electric knife sharpener, then this is definitely the way to go. The good thing is, it will only cost you twenty bucks. Whatever model you decide to go with, make sure you are comfortable operating the machine. The safest option will always be the best option when sharpening a knife. Make sure you look over all of the pros and cons to all the models to ensure you purchase the best electric knife sharpener that will last a lifetime.